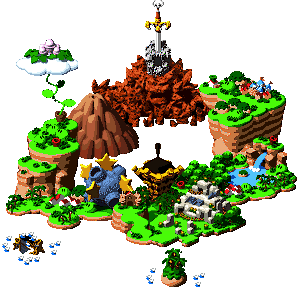 Rose Town is a town Mario travels to in Super Mario RPG: Legend of the Seven Stars. From Tadpole Pond, Rose Town can be reached via Rose Way. It is also connected to the Forest Maze and Pipe Vault. When Mario arrives, arrows are being fired at the town by Bowyer. These arrows contain a toxin that paralyzes anyone unfortunate enough to be struck by one, and any inhabitants outside of a house have been frozen in place. Mario later finds the Rose Town inn. The little Toad boy Gaz convinces his mom, who runs the inn, to let Mario play dolls with him. However, while they are playing around, Gaz activates the Geno doll's Star Shot, which fires bullets that knock out Mario. During the night, the Star ♡♪!? possesses the Geno doll to go out and retrieve a Star Piece from the Forest Maze. In the morning, after Mario wakes up, Gaz claims to have witnessed this occur. 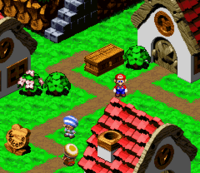 Having heard this, Mario and Mallow head into the Forest Maze. After defeating Bowyer, the town's inhabitants that are frozen return to normal. The Toads of Rose Town all have striped mushroom caps with a large circle directly on top, making their caps appear like target boards. This is fitting, considering what happens to them during the attack. Places of interest are the inn (where Link can be seen sleeping) and the shop. Rose Town is also home to the Gardener. The Toad residents having striped caps may be a subtle way of making them look more like targets from above, to play off of how Bowyer is shooting arrows at them. This page was last edited on November 28, 2018, at 23:30.